I like having books around because I find them pretty, for example. Their somewhat random presence is a reminder of things past, almost always in a nice way. A well-made book has a very pleasant feel, a tactile sensation that makes you want to hold it. The words themselves are only a part of it. But some things have changed. For instance, Amazon explained in a press 2009 press release that e-book sales outpaced physical sales on Christmas Day (largely due to people shopping for their new Kindles). Since 2011-04-01, Amazon US has sold 105 Kindle books for every 100 physical books, paperback and hardcover. Amazon UK, whose Kindle store was launched in 2010, reports selling 242 e-books for every 100 hardcovers. One explanation for this rapid growth might be that most Kindle versions are cheaper than the printed edition. Until now publishers rarely, if ever, offered deals for those wishing to purchase the printed and e-version of a book (e.g., purchase hardcover – get e-version for free). One convincing argument for the e-book’s success is the ease of storing many titles on a single, small device that is easily carried. Moreover, e-readers’ usability has evolved, in part in order to withstand the competition from multipurpose devices such as the iPad (by the way, Amazon will release its own version by October 2011). enhanced capability compared to current products. I also believe that authors and publishers are only just beginning to discover the increased opportunities these devices offer, such as viewing data or graphics far more interactively than ever on paper. The key to sales lies in the authors. If the author is arranging readings and other events, contacting friends through e-mail and Facebook and Twitter, trying to find different (i.e., nonbookstore) venues for giving talks — then that book usually has a life. I wholeheartedly agree and would claim that this applies to both printed and e-books. Various tech gadgets have once again made the book a medium that is adjusting to the changing times and print or e-versions can be used based on your preference. Nevertheless, as long as people continue purchasing printed books at train stations or airports, Gutenberg’s version is here to stay for a while yet. Reading a screen in full sunlight at the beach is difficult and sand might damage the device. 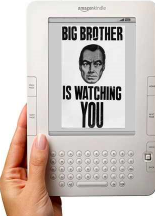 Purchasing an e-reader and downloading books in the US may result in update problems elsewhere in the world due to licensing restrictions (e.g., company A has the US license, while company B has it for France). Color and interactivity of visual displays and graphics are a big plus. Information visualization can offer concurrent views and selecting any data in a single view to highlight part or a subset thereof. Searching for content, keywords and authors, as well as copying and pasting material for further use when trying to learn about a subject is a great feature of e-books. Considering that more than 200,000 books are published annually in the US and over 100,000 in the UK, these devices offer new opportunities regarding graphics, interactive design, etc., but like many, I still prefer the printed version I can mark up, take on the train and read in bed. Most importantly, I can be sure it is still accessible in 15 years, while the e-reader format may have made my e-copies useless by that time. Clearly, books will continue to thrive, be it in print or e-format (e.g., Google’s effort to digitize books see also Amazon that launched Kindle textbook rentals on 2011-07-18). Disagree? Sure. Leave a comment!Just one question I hope you will answer: Did you take your e-reader on your trip or pack the print book in your suitcase? Which do you prefer? I look forward to your comments below. Next post: Why did Toyota ignore successful Old Spice?